Even from this side of the pond, racism surrounding the royal wedding has sounded loud and clear, from Princess Michael’s decision to wear a “Blackamoor” black servant brooch to meet Meghan to British tabloids’ incessant, unprompted mentions of Meghan Markle’s race, using references like “straight outta Compton,” and general coded obsession with “breaking royal protocol.” (Oprah is expected to interview Meghan’s mom Doria Ragland on that very topic soon.) 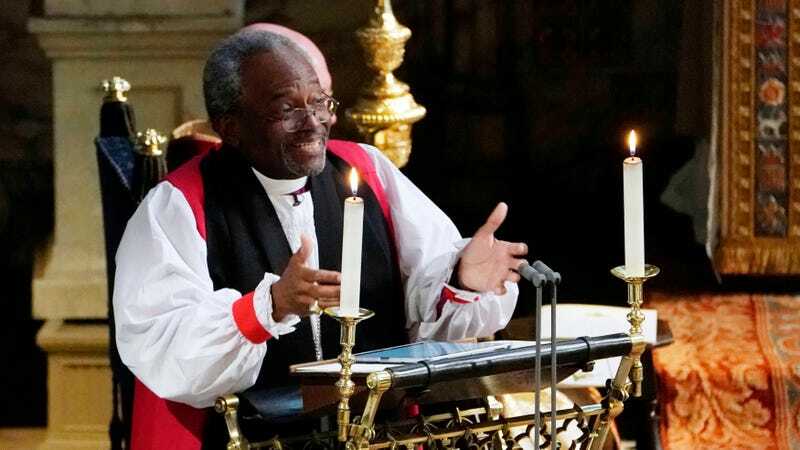 Today, the royal wedding sent a pointedly uplifting rejoinder with a fiery sermon. I’m talking about some power, real power. Power to change the world. If you don’t believe me, well, there were some old slaves in America’s antebellum south who explained the dynamic power of love and why it has the power to transform. They explained it this way. They sang a spiritual, even in the midst of their captivity, it’s one that says there’s a balm in Gilead. A healing balm, something that can makes things right. There is a balm in Gilead to make the wounded whole. There is a balm in Gilead to heal the sin-sick soul. One of the stanzas actually explains why: they said, If you cannot preach like Peter and you cannot pray like Paul, you just tell the love of Jesus how he died to save us all. Oh that’s the balm in Gilead. This way of love is the way of life. They got it, he died to save us all. He didn’t die for anything he could get out of it. Jesus did not get an honorary doctorate for dying. He wasn’t getting anything out of it. He gave up his life, he sacrificed his life for the good of the others, for the good of the other, for the well-being of the world. For us, that’s what love is. And in an intentional break with protocol, Harry has chosen to wear a ring, and Meghan did not promise to “obey” her husband in her vows. Watch the full sermon here.